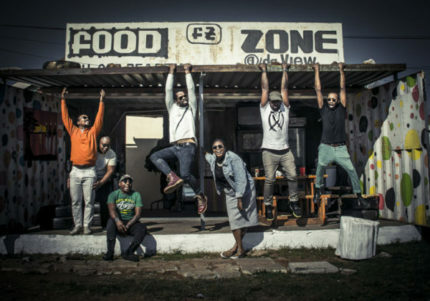 BCUC, AKA Bantu Continua Uhuru Consciousness from Soweto, South Africa who class their music as ‘afropsychedelic’ and ‘africangungungu’ join us for a night of stirring vocals, inventive bass guitar, drums and chanting that will leave you thinking South African music is anything but bland! This seven-piece band where a highlight at Womad Festival and we are pleased to have them play right here in the Eco Park Barn. Their music derives from a blend of genres across the ages. Drawing inspiration from Indigenous music that is not exposed in the mainstream. Singing ritual songs, around the fire hood songs, shebeen songs, church songs and then infuse them with raps and a rock and roll attitude. Always aiming for a timeless, honest and traditional/ ritualistic sound. The music always resonates with the spirituality, the history and the future of the people. As always, La Cantina will be open from 7.30pm until 9pm with a delicious vegan and vegetarian supper. Gig only £12, Gig and Supper £22, more on the door.